Breathtaking Views of the Atlantic Ocean! No need to look any further! This 3 bedroom, 2 bath condo is located off 2nd Avenue North at the gorgeous Sandy Beach Resort. It's right beside 2nd Avenue Piere where you can enjoy fishing, food and fun! Just a few blocks away is Family Kingdom and about 12 blocks away is the famous Skywheel! Enjoy a STUNNING view of the Atlantic Ocean from your private oceanfront balcony! This unit can comfortably sleep 8 guests with king size beds in each of the bedrooms and a queen sleeper sofa. The master bedroom has access to the balcony. It is not a private separate balcony but rather connected to the same balcony accessed from the living area.The bathrooms and kitchen have tile floors and granite countertops. The kitchen comes with stainless steel appliances and is stocked with pots, pans, utensils, silverware and dishes! There are 2 full baths and the master bathroom features a jetted tub. For your convenience, there is a washer and dryer in the unit. Right next to Sandy Beach Resort is the famous Second Avenue Pier! This features the Pier House Restaurant which has a breakfast, lunch and dinner menu and an open-air bar (seasonal hours)! Not to mention a remarkable view of the Atlantic Ocean! For a small fee, you can enjoy some fishing ($2 General Admission or $10 daily fishing pass)! **A SC fishing license is NOT required to fish on the pier. (they purchase a commercial license). 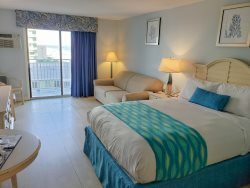 Sandy Beach is within walking distance of some of Myrtle Beach's most loved attractions including Family Kingdom, Splashes Oceanfront Water Park, and the Myrtle Beach SkyWheel! Please note there is a light switch on the counter that controls the dishwasher. If the switch is off, the dishwasher is off. Get ready to unwind and relax at one of the oceanfront outdoor pools or hot tubs and watch as the kids enjoy the kiddie pool, which includes dump buckets, waterfall umbrellas and the silly sub! The weather can't mess up your fun because we also have an indoor pool and lazy river! The on site fitness center includes treadmills, elliptical cross trainers, stationary bikes, cable machines, dumbbell racks and more.